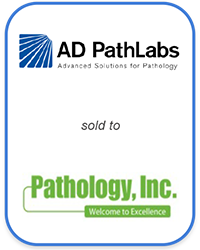 AD PathLabs was a growing Anatomical Pathology and Esoteric testing company based in Southern California, servicing hospitals, surgery centers and physicians primarily in the oncology space. The Company’s business model focused on partnering with local community hospital-based pathologists to allow them to capture professional fees, while driving technical fee volumes. Prior to the transaction, the Company had been losing money for several years and was recapitalized by 3 venture firms and other individual investors, who brought in a turnaround CEO. Investors ultimately decided that the upward trends were strong enough to market the company – there was also different liquidity needs for some of the equity holders so a monetization was desirable. Synergy successfully completed the sale to a larger strategic acquirer – an in-market competitor. The PE / VC funds and individual investors were able to exit at acceptable returns, and perhaps more importantly, investors were able to avoid / transfer the significant liability of maintaining patient specimen records for long durations (as mandated by regulations).